An award-winning author and lifelong collector of quotes offers an invaluable resource for speakers, preachers, teachers, and writers. A prolific, award-winning author and accomplished public speaker, Bob Kelly has made a living by mastering the use of language and sharing words with others. 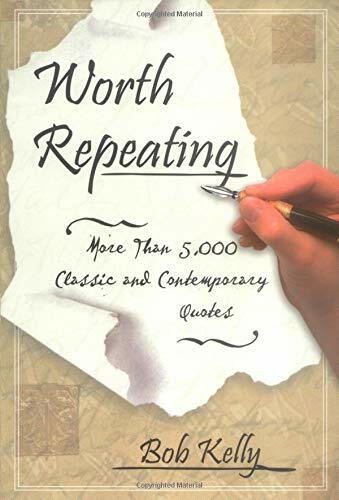 This collection includes familiar quotes along with a variety of unique quotes gathered by Kelly over the course of twenty-plus years. Selections range from funny to profound, from inspirational to entertaining, from educational to spiritually motivating and uplifting. Includes author index. Bob Kelly is an experienced teacher, seminar leader, speechwriter, public speaker, and author. He is also president of WordCrafters, Inc., a firm that specializes in writing and editorial services. Fran, married in 1989. Met in SS at Lake Avenue Church, Pasadena, CA. Bob has 5 grown children & one stepdaughter, plus 11 grandchildren (7/02). BS, Fordham Univ. (Journalism Graduate Banking Certificate, Rutgers Univ. Graduate work in acctg & public relations at Fordham & NYU. No denomination. Evangelical, non-denom church. Currently is Founder & President of WordCrafters, Inc. Enjoys visiting g-children, reading, writing poetry, playing gofl, biking, walking, swimming, etc. Favorite vacation - 3 weeks in Australia. Beautiful country, wonderfully warm/friendly people. Embarrassing - once had the lid fly off a ketchp bottle while shaking it in a restaurant - (see file would love to travel to Ireland - trace roots; born on St. Patrick’s day & would love to see the country he evangelized. Robert J. Kelly - Bob. Why this book? has a collection of nearly 400 published volumes of quotations dating back to the mid-19th C, plus thousands of other quotes collected over the years. Lifelong love affair with words - wants to share fav. quotes with others.